If you haven’t noticed, I’ve become a bit obsessed with the prospect of an exiled and extracted Phillips Library; even though I’m living through it, it’s still difficult for me to grasp how this could happen to a city with as rich a heritage as Salem—-to any community really. I just don’t understand how or why the Trustees of the Peabody Essex Museum could acquiesce to such a radical policy, but then again, I don’t have many insights into the role(s) of contemporary trustees: I am governed more by characterizations from the past than present examples. I can suppress thoughts of Salem losing nearly all of its material history for a day or two, but then they come raging back: in dreams (or nightmares), first thoughts upon waking, and last thoughts at the end of the day. Lately I’ve found myself conjuring up people from the past and asking (myself–not them!) what they would think or do in this situation: Dr. Henry Wheatland, who devoted his life to the Essex Institute by all accounts, or James Duncan Phillips, the great Salem historian after which the Library is named. These men would not be happy, and they would make their unhappiness known, no doubt. But I think this particular crisis calls for another Essex Institute trustee from the more recent past: the pioneering preservationist Louise du Pont Crowninshield (1877-1958). I just know she would never let this happen. Louise was a Gilded-Age princess: the heiress to the du Pont industrial fortune, raised at Winterthur, and married to Boston Brahmin (with Salem roots) Francis Boardman Crowninshield in 1900. 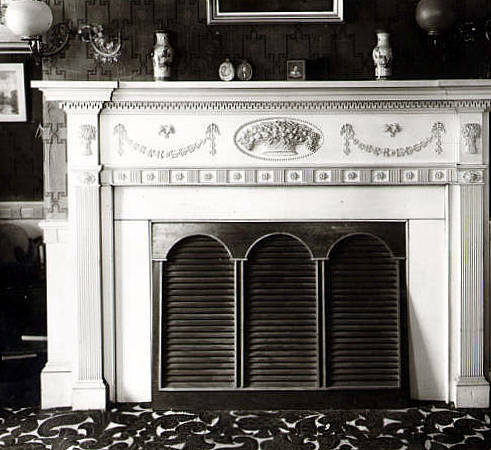 She mixed in all the right circles but was obviously not content to just play and party: like her brother Henry, she was an energetic student and collector of early American material culture, and this passion brought her into the early preservationist movement. 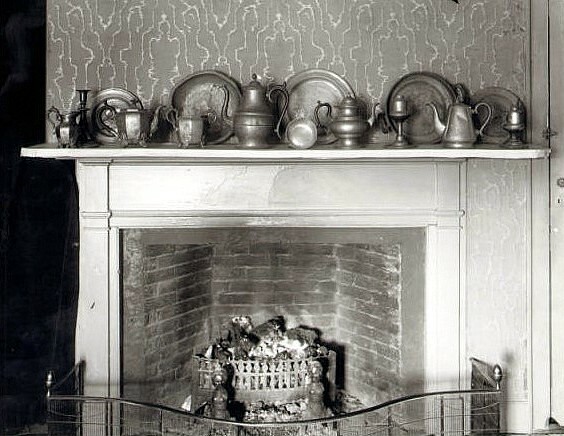 After restoring her family’s original homestead, Eleutherian Mills, she became involved with the rebuilding and restoration of two historic Virginia properties related to George Washington: Wakefield, his birthplace, and Kenmore, the Fredericksburg plantation that was home to his sister and her family. 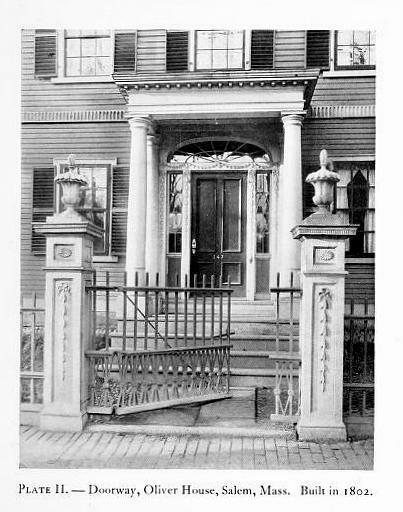 Crowninshield then worked her way up the east coast, participating in a succession of preservation initiatives, including Independence Hall in Philadelphia and several Massachusetts properties: Gore Place in Waltham, the Lee Mansion in Marblehead (where she and her husband summered at a beautiful estate on Peaches Point), the Wayside Inn in Sudbury, the Mission House in Stockbridge, and two Essex Institute houses: Peirce-Nichols and Gardner-Pingree. 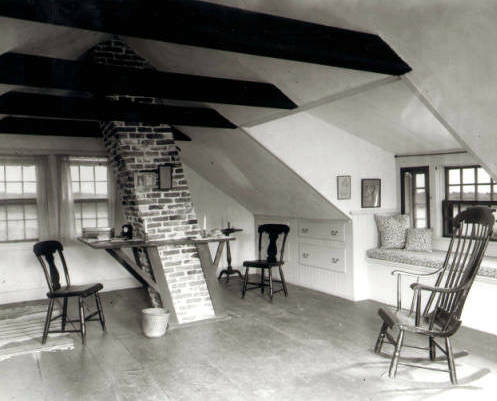 Her interest and investment in another Salem house, the Derby House, was integral to the establishment of the Salem National Historic Site as the first national historic site in the NPS. She was one of the founding trustees of the National Trust for Historic Preservation in 1949 and is the namesake of its most prestigious award. Louise du Pont Crowninshield in the center of the “Kenmore Ladies”, 1930s. Louise du Pont Crowninshield was a powerful woman: so powerful that the substantial contributions she made towards the restoration of the Gardner-Pingree house in the 1930s entitled her to dictate (apparently–I’m relying on written hearsay here) that no mention be made of her relative-by-marriage’s key role in the savage murder of Captain Thomas White in the house in 1830 when it was opened for tours a century later, and to place furniture in the Derby House that was perhaps a bit “old” for its period. But her capital and connections were utilized overwhelmingly for the public good rather than vanity or recognition. She was committed: to her belief that Americans will be better for having around them some visible remains of their past, as well as to the importance of place in general and Salem in particular. She served on the boards of both the Essex Institute and Peabody Museum, and as President of the Salem Maritime Trust as well. If Mrs. Crowninshield was alive today I have no doubt that she would spare no expense of her cultural capital (telling her Marblehead neighbors and fellow trustees: we are not going to do this to Salem), and perhaps also her capital, to ensure that the Phillips Library was returned to Salem, adjacent to the buildings in which she invested so much of herself, and which bear her name. We need her now. 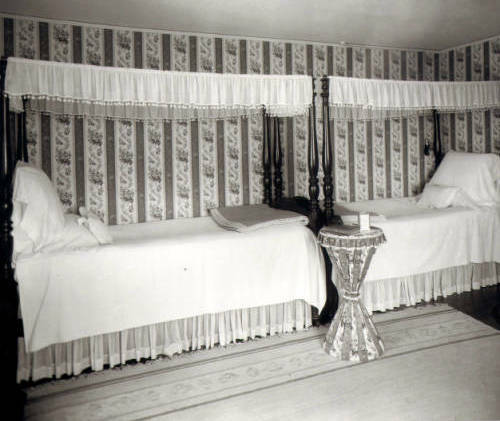 Helen Comstock’s influential 1958 coffee-table book 100 Most Beautiful Rooms in America was a veritable memorial to Louise du Pont Crowninshield in the year of her death, with pictures of Winterthur, Kenmore, and (above), a Peirce-Nichols bedroom, the Crowninshield Memorial bedroom in the Gardner-Pingree House, and the Lee Mansion parlor. 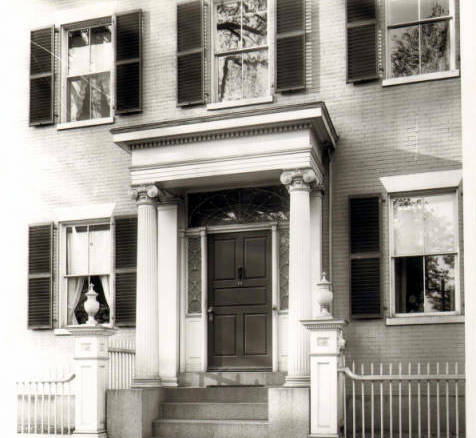 A true memorial is the Crowninshield-Bentley house, which was removed to the Essex Institute campus from its original location further along Essex Street and restored by subscription in 1959-60 in tribute to Mrs. Crowninshield. (Love these historic house pamphlets published by the Essex Institute in 1976-78—scoop them up if you can find them). P.S. And of course there are Crowninshield papers in the Phillips Library deposited by Mrs. Crowninshield, as well as other purchased and donated in her memory. I am absolutely fascinated by this c. 1780s mezzotint depicting the capture of Major John André which I recently found in the digital collections of the Winterthur Museum for several reasons: it is by a Salem artist, Samuel Blyth (1744-95), more primarily known for his heraldic paintings, musical instruments, and the fact that he was the older brother of the more prominent pastellist Benjamin Blyth(e), its naïve presentation, in which everyone looks strangely happy rather than surprised, and its lyrical title: Ye foil’d, ye baffled Brittons/This Behold nor longer urge your Pardons, Threats, or Gold; Seen in each virtuous Patriotic Zeal/ To save their country and promote its weal/ Disdaining bribes to wound a righteous Cause/ While ANDRE falls a victim to the laws. I am also interested in this image because it gets the essential detail of André’s capture—the fact that he was dressed in civilian clothes rather than a uniform, which led to his arrest, prosecution, and execution as a spy—wrong. The Major is clearly in uniform here, and the New York militiamen who captured him look a bit too “regular” as well. Contrast this with one of many depictions of the capture issued in the mid-nineteenth century, when everyone has their story–and image–straight (well nearly everyone: a Currier and Ives print somehow places George Washington in the scene). By that time, after Thomas Sully’s influential 1812 painting, André is uniformly uniform-less and boot-less, with the papers relating to the capture of West Point supplied by Benedict Arnold revealed. Capture of Major John Andre by John Paulding, David Williams and Issac Vanwart, New York: Sowle and Shaw, 1845, Library of Congress; The Capture of Major André, Thomas Sully, 1812, Worcester Art Museum. Could Blyth’s mezzotint be the first image of André’s capture? I can’t find an earlier one, and that would be yet another Salem “first” (and first impressions are often wrong). This would explain his mistaken details–although he certainly has the bribery attempt down. What is the source of his vision, and his copy: the Foil’d and Baffled Brittons? Was he carving out a future for himself in the emerging industry of patriotic publishing? Apparently earlier mezzotints of George and Martha Washington once attributed universally to Boston printmaker Joseph Hiller might have been the work of Blyth: these images cast a man who has been primarily associated with rather elitist creations in a new, populist light—a Revolutionary transition doubtless made by many American artists. Holyoke Family Coat of Arms, late eighteenth century, attributed to Samuel Blyth, Northeast Auctions; Lady Washington and His Excellency George Washington Esq., mezzotints after Charles Willson Peale, c. 1776-77, possibly Joseph Hiller or Samuel Blyth, Metropolitan Museum of Art. It is interesting to trace the adoption of the eternal eagle as a national symbol for the United States in the first fifty years of its existence, and its adaptation in Europe and Asia by entities eager to take advantage of the new American market. The eagle has been used in heraldry since time immemorial, so it took more than baldness to make it American (remember, Benjamin Franklin preferred the turkey for the national symbol, in part (I think!) because eagles were so universal). There’s a very informative essay on “Eagles after the American Revolution” at the Metropolitan Museum’s Heilbrunn Timeline of Art History (a resource I use often) which commences its analysis with Edward Savage’s Liberty, reproduced on reverse-pained glass in China for the American market around 1800. The image shows the former American emblem, a native goddess representing Liberty, passing her torch to the new not-very-bald American eagle. Chinese reverse-painted glass depiction of Edward Savage’s 1796 print “Liberty”, c. 1800, Metropolitan Museum of Art. And after that, a veritable explosion of American eagles, appearing in all sorts of poses and forms before standardization occurs. There is a relatively rare eagle emblem from this era that seems so Salem to me: a triumphant seafaring bald eagle rides into a harbor on a shell boat, with shield and flag brazenly displayed. The harbor looks more romantic than federal, but still, the image seems to represent the commercial and maritime foundations of the American enterprise. This past weekend, I almost purchased a saucer bearing one of these “Eagle riding on/in a shell” images, but ultimately decided it was too dear. Manufactured by only one Staffordshire pottery firm, R. Hall & Son, in the 1820s and 1830s, it seems to be one of the few transferware patterns that has held its value over the past decade. I’m not bound to such designations, but as we’re almost running out of Women’s History Month and our mayor has declared March 29 Salem Women’s History Day I’ve decided to feature a notable Salem woman on this last weekend in March. After much deliberation–as there are many notable women in Salem’s history–I’ve settled on the author and entrepreneur Mary Harrod Northend (1850-1926). She has interested me for some time, and she’s popped up in several posts in the past, but she deserves her own. Northend was from old, old Massachusetts families on both sides, and this heritage is key to her life and work. 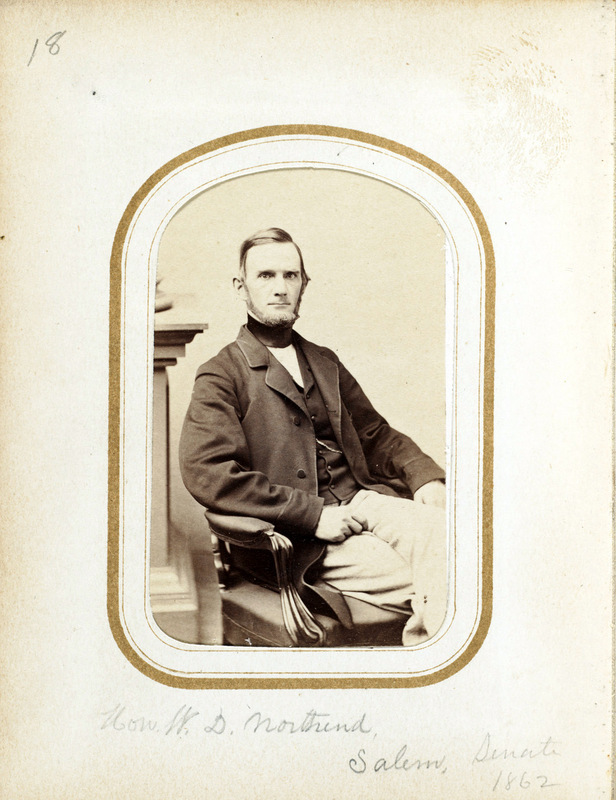 Both parents were actually from northern Essex County, but moved south after their marriage: her father, William Dummer Northend, became a prominent attorney and a state senator for Salem. 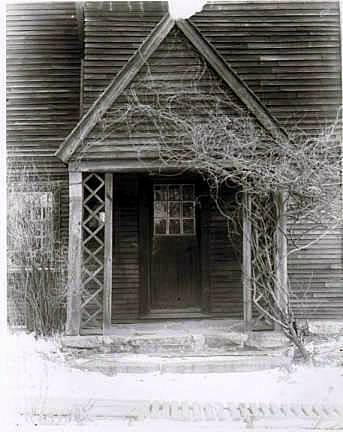 Mary was born at 17 Beckford Street, a side-to-street late Federal house, but the family moved over to Lynde Street, in the shadow of the Federal Street courthouses, in the later 1850s. Their grand Italianate double house, photographed for Mary’s books later, is now sadly chopped into 12 apartments by my count. 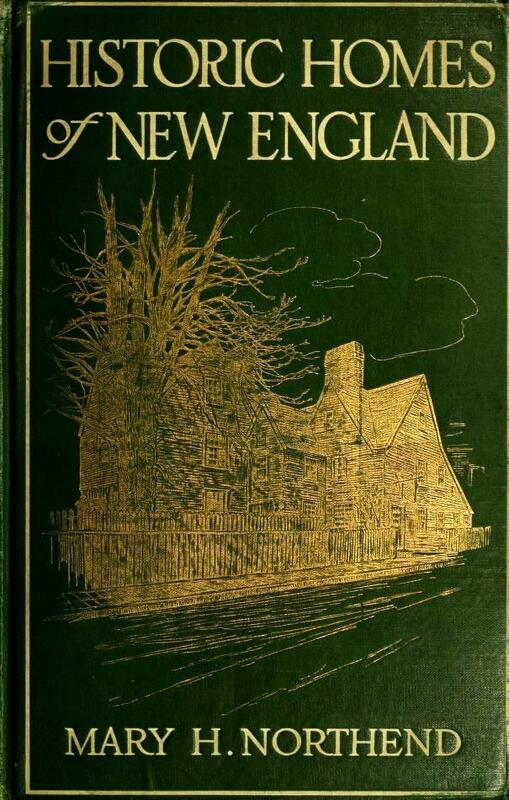 The few biographical details I could gather refer to a childhood sickness; in fact by all accounts (or by no accounts) Mary led a quiet life in her childhood and adulthood, until she burst out in her 50s and started writing all about colonial Salem and colonial New England, necessitating regional travel, which she clearly embraced. Eleven books were published between 1904 and 1926, when she died in Salem from complications sustained from a car accident, and many, many articles for magazines such as Good Housekeeping, The Century and The House Beautiful: I haven’t had time to compile a proper bibliography. 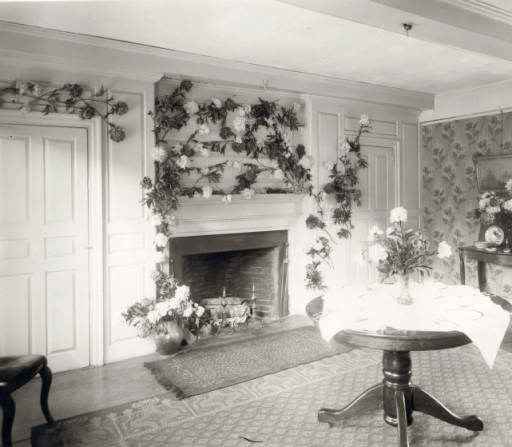 But she was an incredibly prolific woman: an acknowledged expert on New England architecture and antiquities, with a touch of Martha Stewart-esque domestic stature as well, forged by her publications on decorating and party-planning. 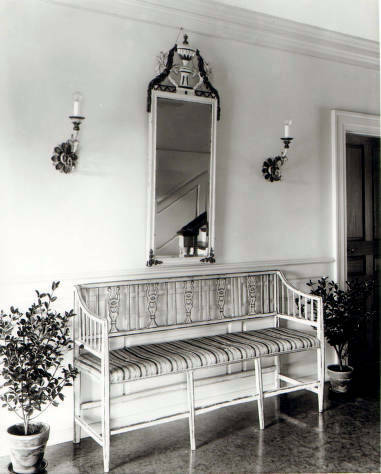 Let us, she writes in a very Martha tone in The Art of Home Decoration: link the old and the new, working out entrancing combinations that are ideal, making our home joyous and bright through the right utilizing of great grandmother’s hoard. 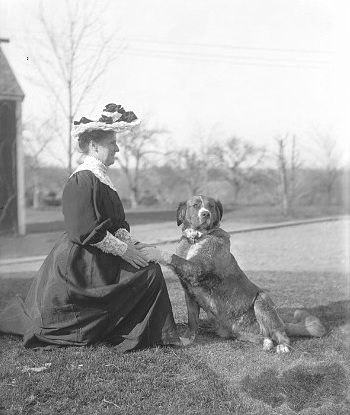 Mary Harrod Northend (and dog), circa 1906, in the early phase of her writing career, Historic New England; her birthplace at 17 Beckford Street, Salem; her father William Dummer Northend, newly-elected State Senator from Salem, 1862, State Library of Massachusetts. Her books and articles reveal Mary to be a fierce advocate for “Old-time” New England; she is at the forefront of that (second?) generation of strident Colonial Revivalists, fearful that the (changing) world around them hasn’t developed proper appreciation for colonial architecture and material culture. 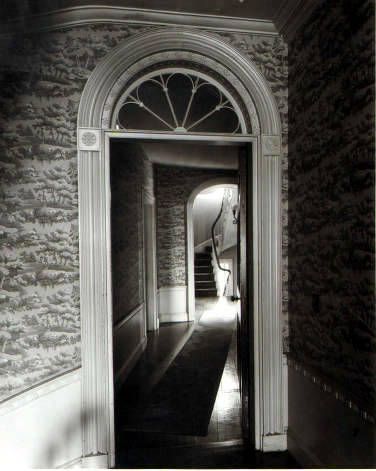 She is evangelical in her love of clapboards, mantles, arches, doorways, garden ornaments, pewter and seamless glass. The phrase “detail-oriented” doesn’t even come close to capturing Mary’s appreciation of the things that were built and made in the colonial past: these things are her life and her world. And like any good educator–which she was–Mary wanted her (growing) audience to see her world and so she spared no expense when it came to photography, first taking her own photographs and then “directing” commercial photographers in the manner of a cinematographer, according to Mary N. Woods’ Beyond the Architect’s Eye: Photographs and the American Built Environment (2011). The end result was a vast collection of still images (there are 6000 glass plate negatives in the collection of Historic New England alone, though the entry in the biographical dictionary Who’s Who in New England for 1915 indicates that Mary has “20,000 negatives and prints of American homes”) which she used to illustrate her own books, sold to other architectural writers, and colorized in the style of Wallace Nutting to sell directly to the public. 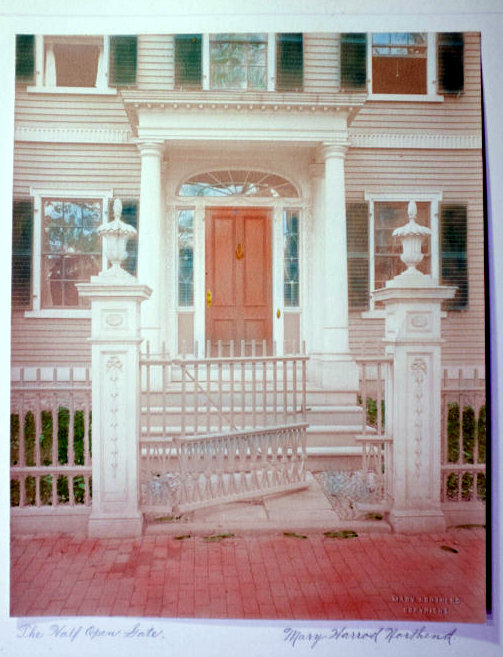 Two of Northend’s most popular titles, Historic Homes of New England (1914) and Historic Doorways of Old Salem (1926); the Cook-Oliver House on Federal Street in Salem, featured in Historic Homes and sold as an individual colorized print, “The Half Open Door”. 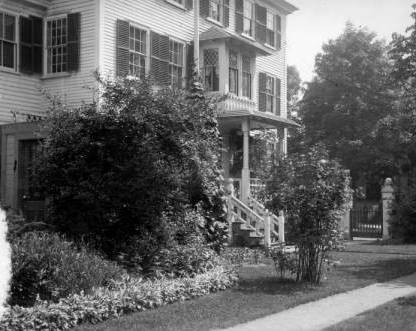 It’s relatively easy to research the work of Mary Harrod Northend: her books are still readily available in both print and digital form and prints from her photographic collection are at Historic New England and the Winterthur Library. But I wish I knew more about her business, the business of publishing books and photographs, writing, lecturing, collecting. I’m also curious about money: there’s definitely a bit of voyeurism in Northend’s books and I can’t discern why she remained in the family home on busy Lynde Street rather than move to the McIntire District just a few blocks away. 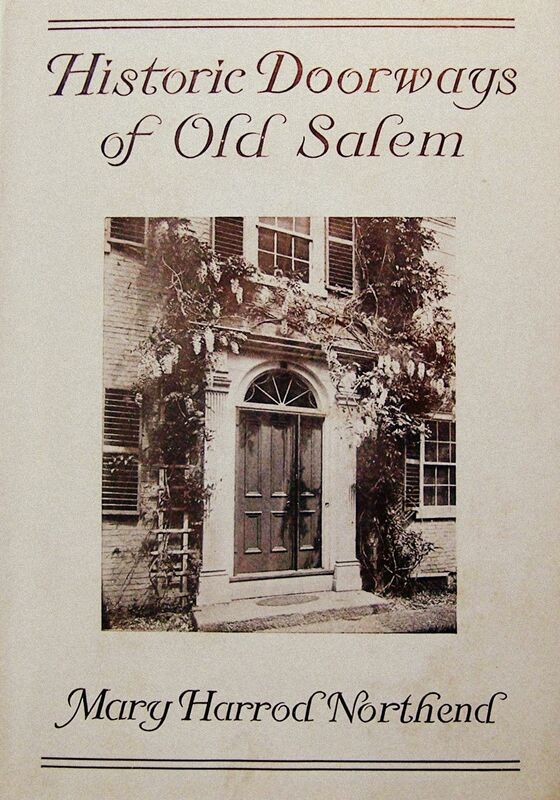 In one of her most personal, yet still fictionalized, books, Memories of Old Salem: Drawn from the Letters of a Great-Grandmother (1917), the great-grandmother in the title lives on Chestnut Street, but Mary never did. 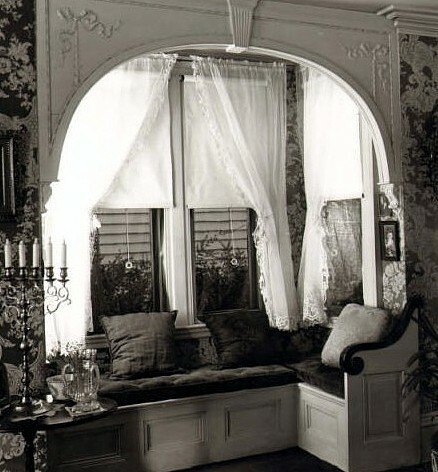 This might have been a family matter: her widowed mother and sister lived right next door in the Italianate double house, which was also an appropriate “stage” for some of her photographs. I also think it was quite likely that Miss Northend was seldom at her own home, as she was so busy documenting those of others! 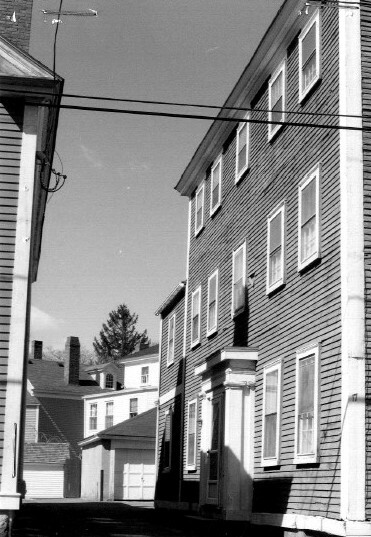 Three very different Salem houses: doorway at the House of the Seven Gables, entrance of 10 Chestnut, side view of the Robinson House on Summer Street. 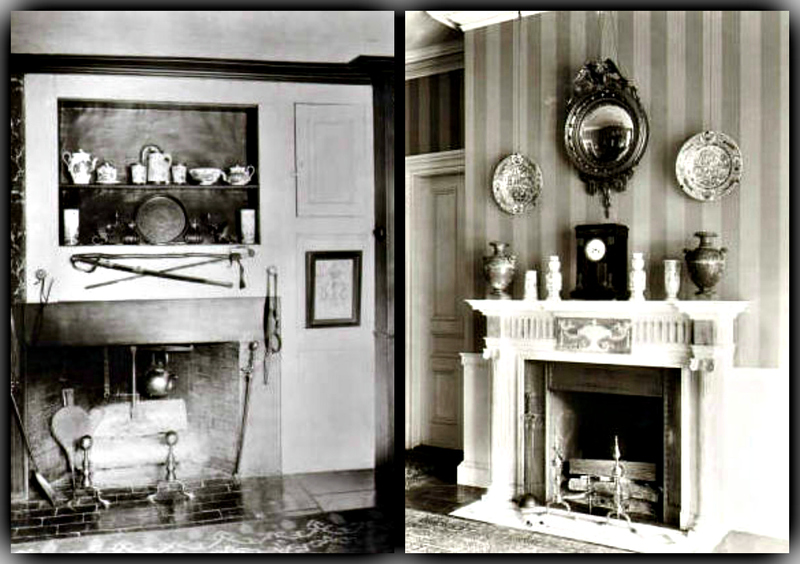 Salem mantles: a pewter display, McIntire mantle at the Waters House (LOVE this louvred fire screen), Whipple and Pickman mantles. 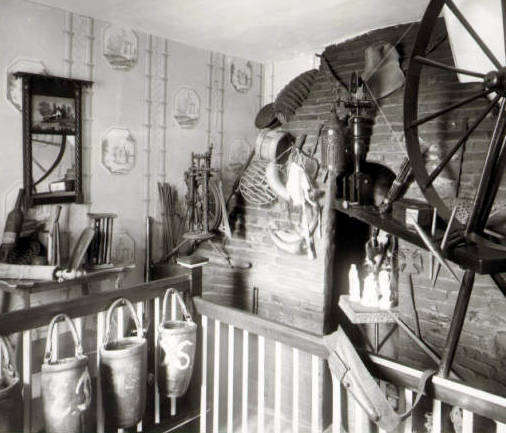 Flagrant displays of Colonial Revivalism: Spinning wheel and fire buckets at the Kate Sanborn House, and Miss Northend’s own house on Lynde Street, all dressed up for Spring.